IMPORTANT: THIS IS NOT THE LATEST EDITION. 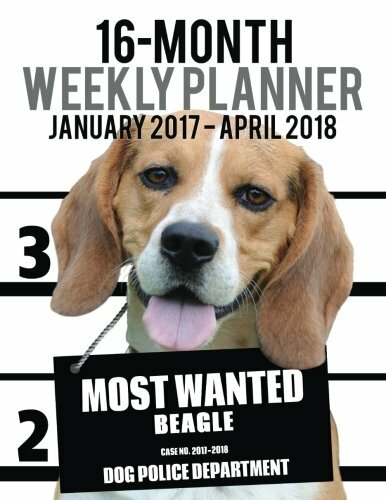 NEW EDITION NOW AVAILABLE:- 2018-2019 WEEKLY PLANNER – MOST WANTED BEAGLE is now out. The edition you are looking at on this page goes up to April 2018. New edition goes from January 2018 to April 2019. &nbsp2017-2018 Weekly Planner for Dog lovers - Beagle lovers in particular! Adorable Most Wanted Beagle image graces the cover of this cute engagement calendar. &nbspPopular easy to use planner format shows a week-at-a-view to help keep you organized 7 days at a time. Calendar/planner covers 16 months (January 2017 -- April 2018). Helpful for anyone wanting to take charge of their time and manage their activities in 2017 and into 2018. Perfect for students and business people alike. &nbspGreat for keeping track of all your business and social engagements for the next 16 months. &nbspNice Large A4-letter size (11 X 8.5-Inches) format for plenty of room to write your stuff. &nbspSoftback binding opens flat for ease of use. &nbspWe think you’ll find this a fantastic time management tool for home, school, office, or anytime when you’re on the fly and need to schedule! Makes planning and scheduling a breeze!